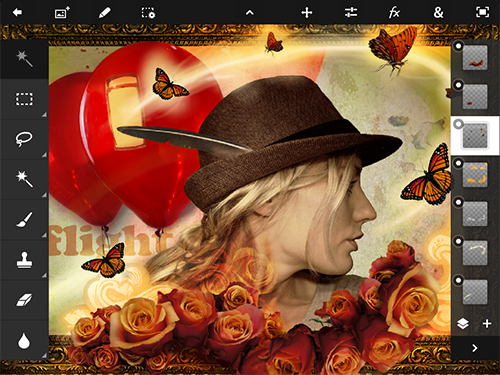 Adobe is updating its Photoshop Touch app for more tablet users. An updated version of the Adobe Photoshop Touch app offers optimization for smaller tablet displays, including the iPad Mini and Google Nexus 7. iPad users will also see more stylus support for Pogo Connect, Jot Touch and JaJa. The latest version is now available for iPad from the iTunes App Store, and for Android from Google Play and the Amazon Appstore, for $9.99. Adobe today announced the immediately availability of Adobe Photoshop Touch 1.4, which brings optimization for smaller tablet displays including the iPad Mini and Google Nexus 7, in addition to new features and bug fixes for all users. The update comes on the heels of Adobe and Amazon’s earlier announcement of Photoshop Touch availability in the Amazon Appstore and support for the Kindle Fire and Kindle Fire HD. Yeah that's terrible. Wacom and N-Trig are probably the #1 and #2 industry standard for active digitizer pens too. Its probably just an Android limitation. There probably isn't a standard "Pressure" level for touch points yet. If Android natively supports pressure, I bet it would be easy for apps to support universally. There at least 3 free apps(well I only use three) from the marketplace on my Thinkpad Tablet that offers full pressure support. If small companies can do it, I don't see why a large company like Adobe couldn't. Could you let us know which one you use? Well my favorite is Papyrus, which is an app you can use to take notes, draw on a blank sheet of paper, or even do work on graph paper. The other I use Marker, which is just drawing app using markers. Both really take full advantage of the tablets pressure sensitivity. So, they add pressure sensitivity for the iPad, which not everyone has those specific accessory pens, but not for Android, which device like the Galaxy Note 10.1 comes standard with a wacom Pen, or even the Thinkpad Tablet with the N-Trig pen? Not cool Adobe.